First atlas edition of Colton's iconic Texas map. 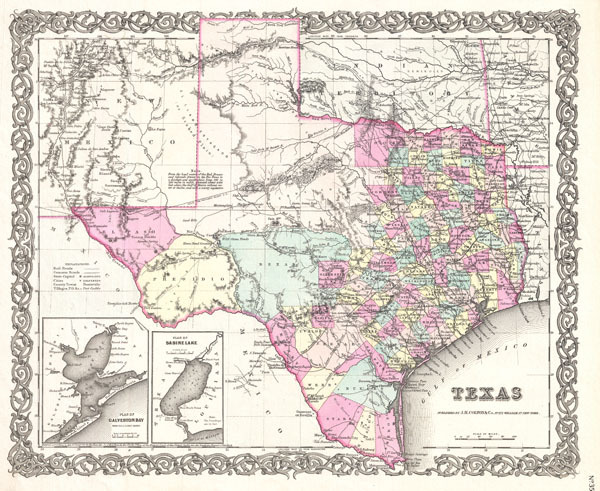 A beautiful 1855 first edition example of Colton's map of Texas. Largely based on the important De Cordova map of Texas, this map covers the entire state as well parts of adjacent New Mexico, Arkansas and the Indian Territory (Oklahoma). Names a number of historic routes, including Connelly's Trail, Lieutenants Smith and Whiting's Route, the Comanche Trail, the proposed Route for the Southern Pacific Railroad, and the route to Fort Smith. Colton also comments on the mineral wealth of the land, makes note on good pasturing, and identifies fords and springs. From the head waters of the Red Brazos and Colorado Rivers to the Rio Pecos is a desolate and sterile plain from 100 to 200 miles in width, elevated about 4,500 feet above the Gulf of Mexico, without water or timber, and with a scanty vegetation. Map is hand colored in pink, green, yellow and blue pastels to define counties. Surrounded by Colton's typical spiral motif border. Dated and copyrighted to J. H. Colton, 1855. Published from Colton's 172 William Street Office in New York City. Issued as page no. 25 in volume 1 of the first edition of George Washington Colton's 1855 Atlas of the World. Rumsey 0149.041 (1856 edition). Phillips (Atlases) 816.